So I only of three people in my family read my blog. This is sad because, well, I only know of three people in my family who read my blog. Even though I post cute pictures of the kids. And show what we eat for dinner. However, this comes in handy during seasonal projects because I can post what we’ve made for family members and they are none the wiser. I placed an order with Goody Beads a few weeks ago, and I purchased a cute Nana charm that I ran across. So I have already crafted an Easy Mother’s Day Bracelet for my kid’s “Nana.” And the best part? I only needed three supplies! That’s a beginner jewelry project that even I can handle. Approx. 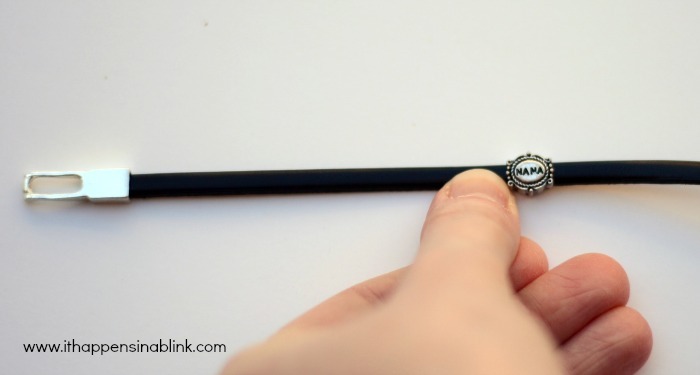 12″ of 5mm Plain Flat Black Leather– this will vary according to the wrist size of the person for whom you’re making the bracelet. Of course, I needed the standard scissors and jewel glue, too! Begin by cutting the leather a little longer then the wrist size. Slide the charm onto the leather. Then take a super blurry picture. 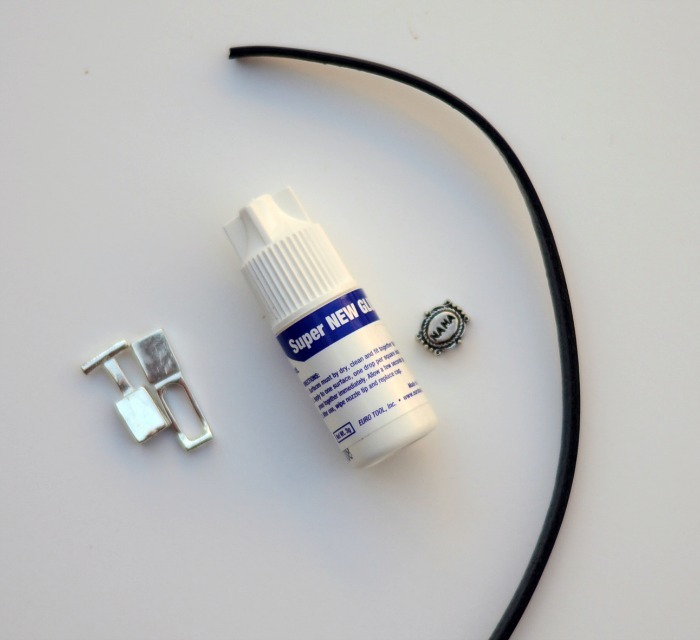 Squeeze a generous amount of glue inside one of the clasp ends and insert one end of the leather into the clasp. Hold it for a few minutes to set. Let dry. Repeat with the opposite end. I’ve made a couple different east bracelets like this. 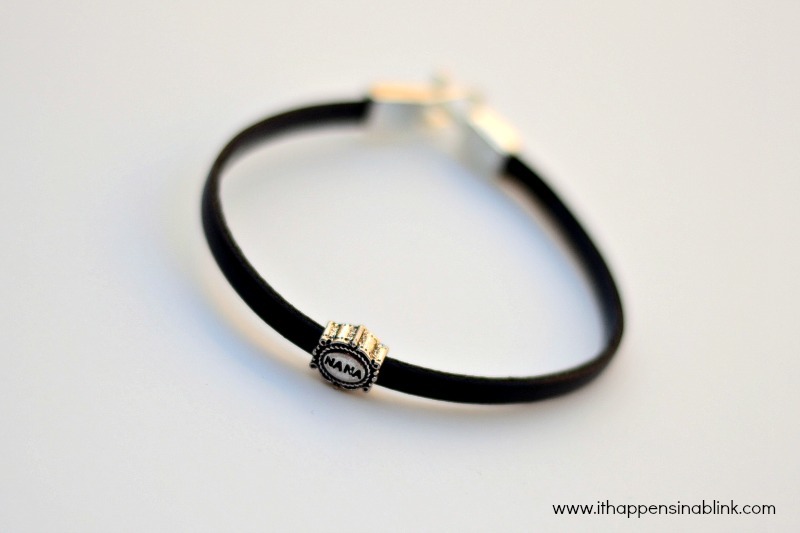 It’s an excellent way to have a customized, handmade bracelet for anyone in the family. Even if they don’t realize that you know how to make stuff. None of my family members really read my blog either, lol! But I know Nana is going to LOVE this bracelet!! Me too, with the no family members reading my blog. Except my sister…so no gifts for my sister on the blog 🙂 Cute bracelet – I like me some easy jewelry projects! I’m honestly not too sure to what extent my family reads… I know I can’t post grandma gifts too soon, though! Last year I posted my husband’s Father’s Day gift and he had to act surprised for the boys- ha ha 🙂 This turned out awesome- that flat leather is super cool! This family member is reading! Hope you were counting me. 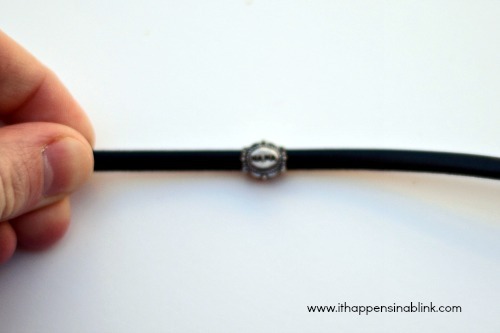 simple and wonderful bracelet–and I’m right with ya, none of my family read my blog either. They think it’s enough to ask, “hey, what’s going on on the blog” when they see me. Oh well! That is too cute, I love the “nana” charm! This bracelet is so cute. She will LOVE it! Great idea. I totally get the “3 people in the family”…I only have one…go figure? Love this! 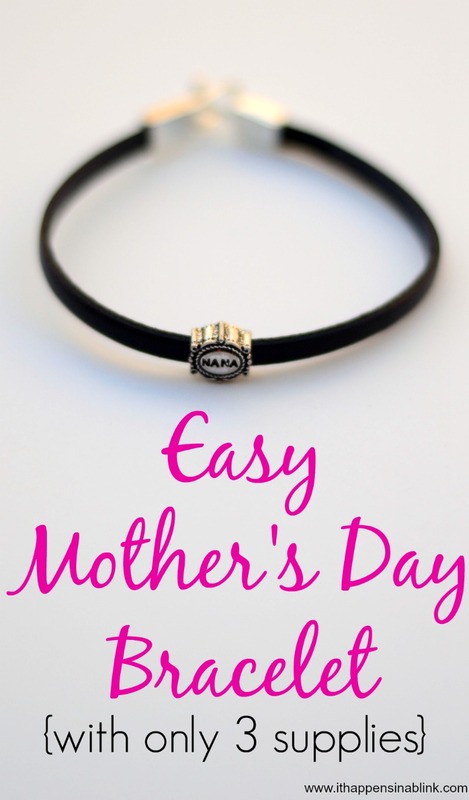 So easy and perfect for Mother’s Day!